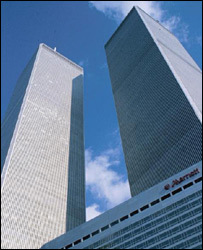 The collapse of the Twin Towers of the World Trade Center (WTC) on 11 September 2001 was not directly caused by the impact of the two hijacked airliners but by the fires that followed. New advances in the smart design and monitoring of buildings could mitigate future disasters and save many lives. The aeroplanes that crashed into each of the WTC towers rapidly developed into large fires that covered several floors of the buildings. 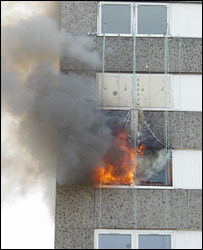 It was a unique challenge to the fire fighters and the fire safety systems put in place for the buildings. Several important lessons about the limitations of current safety practices soon became obvious as the events progressed. Evacuation procedures were initiated, but the dimensions of the towers meant that it took a long time to empty the buildings. The cross flow of fire fighters and occupants exacerbated the problem, as did limited radio communications. One of the towers collapsed 47 minutes after the impact, the other after 104 minutes. This was the first time that buildings of this magnitude had suffered total collapse while the occupants and fire fighters where still following standard response procedures. More than 1,000 fire fighters were sent to the towers armed with their experience and intuition, but with very limited information on the evolution of the event. They lacked knowledge about what was happening in the buildings. As a result, there was no warning before the collapses and more than a third of the fire fighters were killed along with thousands of occupants. 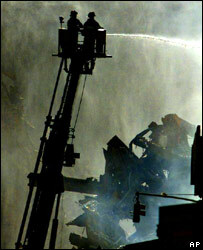 The WTC towers were designed to survive an impact by an aircraft, but not the fire that resulted from this impact. The construction of the steel columns and beams followed a series of rules dictated by the regulations of the time. But there was no knowledge of the overall behaviour and performance of the building in the event of a fire - and that was to prove very costly. Today, with the improved knowledge and modern fire safety engineering at our disposal, we think we can now change some of these catastrophic outcomes. For past 10 years, I and colleagues at the University of Edinburgh have been developing a new high-computing system called FireGrid. It proposes a new paradigm for emergency response, the acquisition and digestion of large quantities of data by means of remote computer resources that can be accessed via the Grid. Sensors within the buildings will provide a window to the inside of the fire while sophisticated computer models will use this information to forecast the progression of an event. While the Twin Towers had many sensors installed (smoke alarms, security cameras, air condition systems), none of these were prepared to deliver information to the emergency responders. The management of this large amount of data can only be done using massive computer resources that are normally unavailable in buildings. It means that is necessary to use remote computer resources and sophisticated computer models to reliably forecast the progression of the event. FireGrid can also be used during the design of a building to anticipate its expected performance for events that are deemed possible. Weaknesses can be identified, corrected if necessary, or simply the information transferred to those fire fighters that will have to deal with an emergency. Such knowledge of the WTC buildings' performance would have allowed weaknesses to have been pinpointed and corrected. For instance, the floors could have been strengthened and redesigned in such a way that in any event, the progressive deterioration of the structure would not have led to a total collapse. The development of such a tool and the demonstration of its reliability have the potential to change the outcome of events such as 9/11, but also to redefine emergency response and the way we design and manage complex buildings.